What are their professions and how many of them have conflicts of interest? Completing a research elective in the Office of Undergraduate Medical Education at the time of the study at the University of Alberta in Edmonton. Research summer student in the Office of Undergraduate Medical Education at the time of the study at the University of Alberta in Edmonton. Biostatistician at the Alberta Research Centre for Health Evidence at the University of Alberta in Edmonton. Objective To determine the professions of those who contribute to guidelines, guideline variables associated with differing contributor participation, and whether conflict of interest statements are provided in primary care guidelines. Design Retrospective analysis of the primary care guidelines from the Canadian Medical Association website. Two independent data extractors reviewed the guidelines and extracted relevant data. Main outcome measures Sponsors of guidelines, jurisdiction (national or provincial) of guidelines, the professions of those who contribute to guidelines, and the reported conflict of interest statements within guidelines. Results Of the 296 guidelines in the family medicine section of the CMA Infobase, 65 were duplicates and 35 had limited relevance to family medicine. Twenty did not provide contributor information, leaving 176 guidelines for analysis. In total, there were 2495 contributors (authors and committee members): 1343 (53.8%) non–family physician specialists, 423 (17.0%) family physicians, 141 (5.7%) nurses, 75 (3.0%) pharmacists, 269 (10.8%) other clinicians, 203 (8.1%) nonclinician scientists, and 41 (1.6%) unknown professions. The proportion of contributors from the various professions differed significantly between provincial and national guidelines, as well as between industry-funded and non–industry-funded guidelines (both P < .001). For provincial guidelines, 30.8% of contributors were family physicians and 37.3% were other specialists compared with 13.9% and 57.4%, respectively, for national guidelines. Of industry-funded guidelines, 7.8% of contributors were family physicians and 68.6% were other specialists compared with 19.4% and 49.9%, respectively, for non–industry-funded guidelines. Conflicts of interest were not reported in 68.9% of guidelines. When reported, conflict of interest statements were present for 48.6% of non–family physician specialists, 30.0% of pharmacists, 27.7% of family physicians, and 10.0% or less of the remaining groups; differences were statistically significant (P < .001). Conclusion Non–family physician specialists outnumber all other health care providers combined and are more than 3 times more likely to contribute to primary care guidelines than family physicians are. Conflict of interest statements were provided in the minority of guidelines, and for guidelines in which conflict of interest statements were included, non–family physician specialists were most likely to report them. Guidelines targeted to primary care should have much more primary care and family medicine representation and include fewer contributors who have conflicts of interest. Two issues appear to be colliding. Family physicians and primary care providers have unique clinical perspectives and provide most patient care. However, clinical experts appear to provide a large portion of the recommendations in primary care guidelines and their opinions might be biased. New standards from the Institute of Medicine indicate that there should be balance of professions among guideline contributors and, whenever possible, contributors should not have conflicts of interest.15 Our primary objective was to determine the professional designation of contributors to primary care guidelines in Canada. Our secondary objectives included determining guideline characteristics that might influence the relative proportion of different professions, as well as whether conflicts of interest were reported in the guidelines and by the contributors. We used the CMA Infobase: Clinical Practice Guidelines Database16 under the specialty “family practice” to identify Canadian primary care guidelines. Guidelines were reviewed independently by 3 authors (G.M.A., C.K., M.R.K.) for inclusion based on relevance to primary care and family practice. Both French and English guidelines were considered for inclusion. Guidelines were included if at least 2 of the 3 reviewers considered them relevant. Duplicate guidelines, such as those published in both English and French or older versions, were also excluded. If guidelines did not provide names of authors or contributors, we contacted organizations that created 2 or more of the guidelines and asked them for contributor details. Two reviewers (R.K., A.C.) independently performed data extraction on each guideline. When data extraction on the first 5 guidelines was complete, results were reviewed as a team to achieve consensus on content. Disagreement was resolved by discussion or third-party review. Data extracted on guidelines included sponsorship sources, clinical focus, jurisdiction (provincial or national), whether conflict of interest statements were included, and whether primary care or something similar (eg, primary prevention or community physician) was mentioned in the title. Guideline sponsorship was classified as government, industry, professional body (eg, College of Physicians and Surgeons of Ontario), society or association (eg, Society of Obstetricians and Gynaecologists of Canada or British Columbia Medical Association), foundation or charity (eg, Heart and Stroke Foundation), other (eg, Canadian Council of Cardiovascular Nurses), and unclear (ie, if no sponsor information was provided). Data extracted on contributors included profession, location (ie, province or territory), and, if reported, presence or absence of conflicts of interest. Many of the guidelines were created by committees or teams of contributors. Some guidelines did not clarify who the authors or contributors were but provided names of committee members or teams, such as guideline group, steering committee, editorial board, external reviewers, additional contributors, independent methods committee, expert committee, executive committee, cost consideration committee, evidence monitoring committee, national advisory panel, and individual guideline subsection committees (eg, “Acute Stroke Task Group” for the best-practice recommendations for stroke care). With such broad variability, we decided to include any author or person participating in any committee as contributors. Profession was determined by identification of degree or mention of profession in the guidelines and by searching provincial colleges of physicians and surgeons’ websites, university websites for those contributors with academic affiliations, government websites, Google, and PubMed or MEDLINE. Most of the analysis was descriptive. Some guidelines were broken down into subsections and each subsection was registered as an individual guideline. We analyzed data on guidelines with all subsections included and with subsections excluded. We used the Fisher-Freeman-Halton test to determine if the proportion of contributors from various professions differed by guideline characteristics. We used the Fisher exact test to determine if the proportion of contributors who reported conflicts of interest differed by contributor profession. We performed 2 sensitivity analyses. First, we identified any family physicians with focused practices who appeared not to be practising generalist primary care, such as those with subspecialty training (eg, emergency medicine) or those doing administrative work only. So as not to inflate the number of other specialists, family physicians with focused practices were not reassigned as other specialists but rather excluded. Second, some of the contributors could appear in multiple committees or groups for the same set of guidelines; we excluded any repeats so any contributor would be counted only once in any 1 set of guidelines. The Canadian Medical Association website listed 296 family practice guidelines, 100 of which were excluded for limited relevance and duplication. Of the 196 guidelines included, 20 did not provide contributor information, leaving 176 for contributor analysis. Figure 1 explains the inclusion and exclusion of guidelines. Agreement between the 2 data extractors was 98%. Details of exclusion and inclusion of the individual guidelines is available from the corresponding author (G.M.A.) by request. Guidelines included in and excluded from analysis: Family practice guidelines listed on the CMA website as of October 24, 2012. CMA—Canadian Medical Association, CPG—clinical practice guidelines. Table 1 presents the proportion of guidelines that included sponsorship information, the principal topic, and whether conflict of interest information was provided. Of the 196 guidelines, there were 4 guidelines with a total of 77 subsections submitted as individual guidelines: obesity (27 subsections), dementia (6 subsections), sexually transmitted infections (29 subsections), and Canadian Council of Motor Transport Administrators (15 subsections). In a secondary analysis, we retained the overview of each of those guidelines but excluded the 77 subsections. Of the 119 remaining guidelines, conflict of interest information was available for 37 (31.1%) of them. Information provided in the guidelines: A) Conflict of interest statements and primary topics. B) Sponsorship information. There were 2495 contributors (authors and committee members) to the 176 guidelines with contributor information. The profession of the contributors and the variation by guideline subgroups is available in Table 2. Overall, 53.8% were non–family physician specialists, 17.0% were family physicians, 10.8% were other clinicians, 8.2% were nonclinician scientists, 5.7% were nurses, 3.0% were pharmacists, and 1.6% were unknown. All subgroup analyses were statistically significant (P < .001), but the greatest differences in the contribution of various professions were seen in the jurisdiction (national vs provincial) and industry funding reported (yes vs no) category comparisons. In national guidelines, 13.9% of contributors were family physicians and 57.4% were other specialists, while in provincial guidelines, 30.8% of contributors were family physicians and 37.3% were other specialists. In industry-funded guidelines, 7.8% of contributors were family physicians and 68.6% were other specialists, while in non–industry-funded guidelines, 19.4% of contributors were family physicians and 49.9% were other specialists. The home province or territory for each contributor is presented in Table 3; the distribution generally reflects Canada’s population. 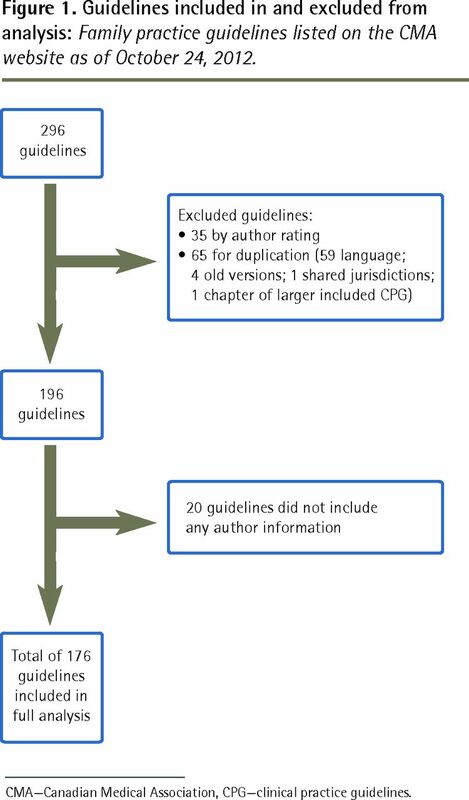 Comparison of contributor information among professions, by guideline characteristics: There were 176 guidelines with contributor information. Table 4 shows the reporting of conflicts of interest by profession. Non–family physician specialists (48.6%) were most likely to report conflicts of interest, followed by pharmacists (30.0%), family physicians (27.7%), nurses (9.9%), nonclinician scientists (9.6%), and other clinicians (2.9%) (Fisher exact test; P < .001). Two sensitivity analyses were performed. The first involved excluding family physicians with focused practices (ie, those no longer doing primary care). The second involved excluding any individuals who appeared more than once in any given guideline. Neither changed the proportion of any profession by more than 1.5% (Table 5). Our study analyzed a range of national and provincial guidelines over a wide spectrum of clinical areas. The results demonstrate that other specialists outnumber family physicians and all other contributors combined in the production of guidelines directed to family practice and primary care. Other specialists were represented more than 3 times more than family physicians were, who were the next most common contributors. When guidelines are targeted at primary care and family physicians, it might be more reasonable that family physicians be represented as much as other specialists are. Family physicians have greater experience and understanding of how to apply guidelines in primary care, and research shows that primary care physicians often have outcomes at least as good, or better, than other specialists do.17–19 The amount of recommendations in guidelines continues to grow,5 and to follow guideline recommendations for preventive health would take more than 7 hours a day20 and to manage 10 chronic diseases more than 10 hours each day.21 Furthermore, when you add in the greater degree of multimorbidity and complexity in primary care, application of disease-focused guidelines becomes unwieldy and unmanageable.11,12 In addition, the spectrum of what is seen in specialty practice often does not translate easily to what is seen in primary care and vice versa, causing a spectrum bias when one approach is not always appropriate for both practices.22 It stands to reason that clinicians who make recommendations or encourage additions to primary care practice but have no foundation in primary care might be providing flawed or unreasonable advice. In our subgroup comparisons, only provincial guidelines had a substantial reduction in the proportion of non–family physician specialist contributors, going from 57.4% of the contributors on national guidelines to 37.3% on provincial guidelines. The proportion of family physician (13.9% to 30.8%) and pharmacist (2.0% to 7.8%) contributors increased from national to provincial guidelines, while the proportion of nurse contributors declined (6.4% to 2.2%). The reasons for the differences are not clear but, apart from the decline in the proportion of nurse contributors, provincial guidelines appear to do a better job finding balance in the representation of professions. Approximately two-thirds of Canadian primary care and family practice guidelines do not provide information on contributors’ potential conflicts of interest. The lack of disclosure in guidelines is relatively common, ranging from 36% to 98% of guidelines examined in other studies.7,24,25 In guidelines that do not provide disclosure information, conflicts of interest likely exist. Another study found that 53% of authors had conflicts of interest on guidelines with no disclosure opportunity.24 In our study, 32.8% of contributors to guidelines that provided disclosure information had at least 1 conflict of interest. We relied on reporting of conflict of interest, but other research suggests that approximately 11% of contributors who deny having conflicts of interest have at least 1.7 We found a statistically significant difference (P < .001) in the reporting of conflicts of interest by different professions. Non–family physician specialists were approximately 20% more likely to have conflicts of interest than the next closest professions of family physicians and pharmacists were. It is interesting that the most common contributors to guidelines, by a large margin, are non–family physician specialists and they are also the most likely, by a large margin, to have conflicts of interest. Given the well-known risks associated with conflicts of interest,26–28 the fact that approximately half of the specialist contributors have conflicts of interest is concerning. Canadian primary care and family practice guidelines are generally sponsored by government agencies or by societies and associations. Only 8% of the guidelines we examined received any industry funding, but those that did generally received funding from multiple (> 4) industry sources. We found that guidelines with industry funding had more non–family physician specialist contributors than those without industry funding did. These results are concerning given that the more specialized clinical experts are, the more likely it is that their interpretations are biased. It is not certain if our results can be applied to other countries, but given the similarities in research (eg, similar percentage of professions reporting conflicts of interest7,24,25), it seems likely to be comparable. Additionally, we used the Canadian Medical Association website to identify guidelines, but the website likely did not capture all Canadian guidelines relevant to primary care. Still, the sample selected is almost certainly large enough to be representative of Canadian guidelines. We examined guidelines for primary care, but this does not mean they were exclusively for primary care. It is likely that many are also read and applied by other specialists too. That said, based on the proportionally higher numbers of primary care physicians and given where most care takes place, proportional representation of family physicians in guideline development remains relevant. Our study did not limit evaluation to authors only, as it included committees and anyone working on the guidelines, which we think strengthened our study. We did not track down conflicts of interest among contributors because this has already been done in other studies. Contributors to Canadian primary care and family practice guidelines are predominantly non–family physician specialists and they are also the most likely to have conflicts of interest. Given the known limitations with clinical practice guidelines, future guideline groups should look to strike a more reasonable balance in professional representation and minimize the participation of contributors who have conflicts of interest. This study analyzed a range of national and provincial guidelines on various clinical topics. The results showed that specialists other than family physicians were not only the most common contributors to guidelines, but they were also the most likely, by a large margin, to have conflicts of interest. Approximately two-thirds of Canadian primary care and family practice guidelines do not provide information on contributors’ potential conflicts of interest. For guidelines that are targeted at primary care and family practice, family physicians, who have greater experience and understanding of how to apply guidelines in primary care, should be represented as much as other specialists are. La traduction en français de cet article se trouve à www.cfp.ca dans la table des matières du numéro de janvier 2015 à la page e50.
. Trends in utilization of lipid- and blood pressure-lowering agents and goal attainment among the US diabetic population, 1999–2008. Cardiovasc Diabetol 2011;10:31.
. Sub-optimal achievement of guideline-derived lipid goals in management of diabetes patients with atherosclerotic cardiovascular disease, despite high use of evidence-based therapies. Diab Vasc Dis Res 2012;19(2):138-45. Epub 2012 Jan 10.
. Why don’t diabetes patients achieve recommended risk factor targets? Poor adherence versus lack of treatment intensification. J Gen Intern Med 2008;23(5):588-94. Epub 2008 Mar 4.
. Analysis of overall level of evidence behind Infectious Diseases Society of America practice guidelines. Arch Intern Med 2011;171(1):18-22.
. Scientific evidence underlying the ACC/AHA clinical practice guidelines. JAMA 2009;301(8):831-41.
. The science of reviewing research. Ann N Y Acad Sci 1993;703:125-33.
. Prevalence of financial conflicts of interest among panel members producing clinical practice guidelines in Canada and United States: cross sectional study. BMJ 2011;343:d5621.
. The ecology of medical care revisited. N Engl J Med 2001;344(26):2021-5.
. Variation in the ecology of medical care. Ann Fam Med 2003;1(2):81-9.
. How applicable are clinical practice guidelines to elderly patients with comorbidities? Can Fam Physician 2011;57:e253-62.
. Adding “value” to clinical practice guidelines. Can Fam Physician 2007;53:1326-7.
. Clinical practice guidelines we can trust. Washington, DC: Institute of Medicine of the National Academies Press; 2011. Available from: www.awmf.org/fileadmin/user_upload/Leitlinien/International/IOM_CPG_lang_2011.pdf. Accessed 2014 Dec 3. Canadian Medical Association [website]. CMA Infobase: clinical practice guidelines database (CPGs). Ottawa, ON: Canadian Medical Association; 2014. Available from: www.cma.ca/En/Pages/clinical-practice-guidelines.aspx. Accessed 2014 Dec 3.
. Impact of physician continuity on death or urgent readmission after discharge among patients with heart failure. CMAJ 2013;185(14):E681-9. Epub 2013 Aug 19.
. The relationship between primary care, income inequality, and mortality in US States, 1980–1995. J Am Board Fam Pract 2003;16(5):412-22.
. Can family physicians help patients initiate basal insulin therapy successfully? Randomized trial of patient-titrated insulin glargine compared with standard oral therapy: lessons for family practice from the Canadian INSIGHT trial. Can Fam Physician 2008;54:550-8.
. Spectrum bias: why generalists and specialists do not connect. Evid Based Med 2008;13(5):132-3.
. Methodologists and context experts disagreed regarding managing conflicts of interest of clinical practice guidelines panels. J Clin Epidemiol 2012;65(7):734-9. Epub 2012 May 5.
. Underreporting of conflicts of interest in clinical practice guidelines: cross sectional study. BMC Med Ethics 2013;14:19.
. Conflict of interest disclosures for clinical practice guidelines in the national guideline clearinghouse. PLoS ONE 2012;7(11):e47343. Epub 2012 Nov 7.
. Conflict of interest in the debate over calcium-channel antagonists. N Engl J Med 1998;338(2):101-6.
. Physicians’ behavior and their interactions with drug companies. A controlled study of physicians who requested additions to a hospital drug formulary. JAMA 1994;271(9):684-9. For family physicians, by family physicians?